﻿ Juventus 2-0 Bayern Munich. A clash of giants to get things started! 25.07.2018 » Juventus 2-0 Bayern Munich. A clash of giants to get things started! 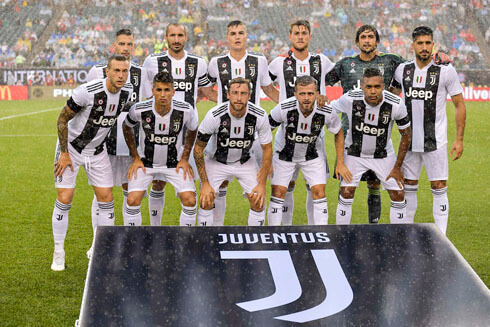 Juventus had their first pre-game fixture this Thursday evening in the United States, as they faced Bayern Munich in Philadelphia and beat the German side by 2-0. Without Ronaldo, who is still on vacation, the Vecchia Signora relied on the killer instinct from Andrea Favilli. After the end of the World Cup roughly 10 days ago, top tier football is back once again and for the most obvious reasons, a lot of things will change this season. Ronaldo left Real Madrid and got transferred to Juventus, which means we'll be shifting most of our football analyses from Spain to Italy, and in a more particularly from Madrid to Juventus. You'll be able to find the best markets to bet on Ronaldo in the season ahead from the bookmakers list on this website. While Cristiano Ronaldo enjoys his last days of vacations from the summer break, the Italian champions already kicked off with their pre-season fixtures in the US, defeating Bayern Munich 2-0 in their first game of the new "Ronaldo-era". There was a big crowd at the Lincoln Financial Field excited with the idea of seeing both these Juventus and Bayern Munich sides in action. Juve, 7 years straight clinching the Serie A title, while Bayern lifted the Bundesliga trophy 6 times in the past 6 years. Two historical clubs meeting in neutral ground, in a rare game where what mattered the less was the result. Everyone is still improving their fitness levels and at this stage of the season, it's all about working as hard as you can without getting injured. The game was a typical pre-season encounter, with both teams looking a bit disconnected on the field and trying to acquire routines. Juventus' coach, Massimiliano Allegri, played one of the strongest eleven he could given the players he had at his disposal, but will certainly change things as soon as the top players like Cristiano Ronaldo, Dybala, Matuidi or Douglas Costa join the group in the days and weeks ahead. 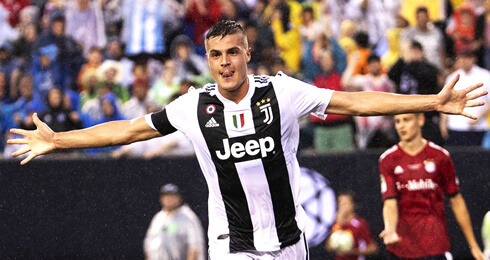 Juventus' first goals in this pre-season were both scored by Andrea Favilli, a 21-year old Italian forward from the Livorno youth academy that Juve signed this summer for 7.5 million euros. Not much money according to today's standards, but you can always click here and try to win a similar amount. Still, roughly 15 times less than what the Vecchia Signora paid for Cristiano Ronaldo just a few weeks away (112 million euros). The opening goal came from a big mistake committed by Bayern Munich's goalkeeper on the night, Sven Ulreich, who attempted to prevent a corner-kick and ended up shooting the ball straight to Marchisio's feet. The Italian midfielder then assisted Favilli in the middle and the young striker had no issues in finishing it off to make it 1-0. That was in the 32nd minute and at the time, Bayern had already been dominating possession and threatening to score a bit more than Juventus. Nevertheless and just five minutes before half-time, the Italian champions added a second to the scoreboard, with Favilli showing Allegri that he can compete for a place in this squad even after the big names are back. Just like in the first goal, Bayern's defense was left exposed, this time in a long ball thrown deep back to their half of the pitch. Favilli was fast to react and beat Ulreich for the second time on the night. In terms of goals, we were done for the night with that second goal shortly before the break. Bayern tried hard to get back in the game after half-time, but neither Ribery or Robben were able to make the difference. 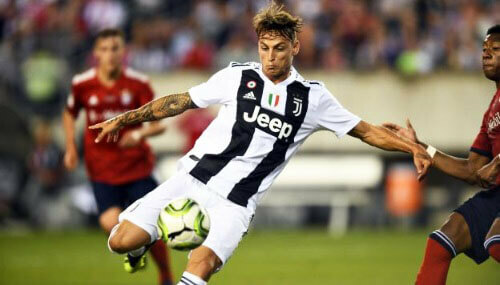 The 2-0 lead was held by Juventus until the final whistle and the Italians will now prepare their next pre-season game against Benfica this next Saturday. Ronaldo will only join the team next week, which is when he returns from vacations. Attackers: Bernardeschi, João Cancelo, Andrea Favilli. Cristiano Ronaldo next game for Juventus is on July 28 of 2018 against Benfica. You can watch Juventus vs Benfica, Manchester United vs Real Madrid, Barcelona vs Tottenham, Manchester United vs Liverpool, Arsenal vs PSG, and Bayern Munich vs Manchester City, all matches provided from our live soccer game pages.